We took a blogging hiatus but we're back - just in time to post some Father's Day projects. These Father's Day gift ideas are inexpensive. You can customize these projects to match the interests of the lucky man who will be receiving the gift. And if you want a project to do with a child, these gift ideas are easy to make. To make this project you will need a photograph, a picture frame, a photo mat, a set of word stamps (in this case Big Mouth) and 2 or 3 inkpads. To help you figure out how best to position the stamps on the photo mat, place several clean clear stamps along one edge. For example, for this project, Eileen (the freakishly Creative Director at Technique Tuesday) placed the "Simply the Best", "Dad", "Ever", and "You are Incredible" stamps along one edge to determine the stamps' positions. Once you've figured out a stamping plan, you can either mark the stamp positions using a pencil or just remember the stamp positions relative to the edge of the photo mat. You may also want to start by stamping on the back of the frame to make sure everything will really fit. One of these picture frames will make a great gift for your husband, dad, grandfathers, uncles, a stepfather, or even big brothers. If you have children, each child can create their own picture frame. Or let each family member stamp one or two sides and sign their name next to their artwork. No matter how you do this project, the man who receives it will cherish this gift forever. To see a bigger picture of this project or to see the products used to make the Happy Father's Day Picture Frame, click here. When Eileen went looking for a cube of sticky notes, she couldn't find any. Instead she bought a package of eight thinner stick notes and stacked them together to make a cube. Start by removing the slick backing sheet on all but one of the pads. Then stick them together to make your own cube. You can use your ribbon (or masking tape) to provide extra stability. Lay the cube on its side so you can stamp straight down onto it and then flip it over to stamp the other open side. Move your ribbon (or masking tape) to expose the two un-stamped sides and finish stamping. Eileen used the Grid Iron and Big Mouth stamp sets to make this sticky note stack. If you'd like to see a bigger picture of this project, click here. · or simply a man who is loved. Dad's going to love it! Who else can you make one for? Celebrate Mother's Day and Get Free Shipping! Here in the USA Mother's Day is May 11 - just 3 weeks away! Although Mother's Day is celebrated on different days throughout the world, in every country it is a time to honor and give thanks for mothers, to take time to reconnect with the woman who cared for us as a child, and perhaps to give her a sweet, handmade gift. Let your mom know how much she means to you by giving her the gift of Technique Tuesday Clear Stamps. When you place an order from now through April 25 on our website and enter the code "Mom2008" at checkout, you'll receive free shipping within the USA on your order. 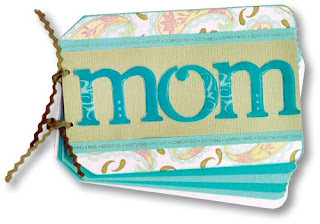 Click Here to learn more about the products used to make the Mom tag book. Place your order soon - free shipping is only available for 1 week! Our newest flower stamp set is called Pocket Full of Posies. 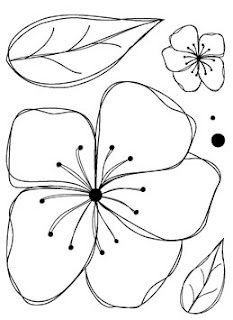 If you prefer a simple style, you can stamp these beautiful flowers and leaves directly onto cardstock. 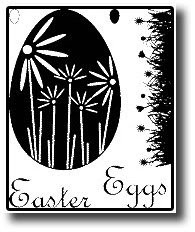 For a more embellished look, like the "Delight" layout, stamp the flowers and leaves onto a transparency using black ink. Then apply acrylic paint to the back side of the transparency to add color. To attach the flowers, we used pretty brads to mimic flower centers. 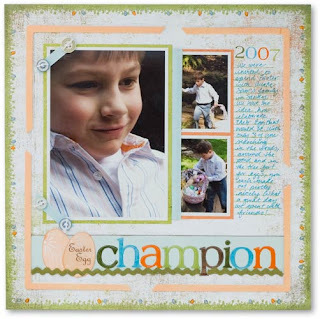 To learn more about the products used to make this layout, click here. The large flower in the Pocket Full of Posies stamp set is 3-inches across and makes a beautiful accent on a layout or card. The smaller flower is just under 1-inch wide and can be used to create a petite bouquet or fill in around the larger flower. 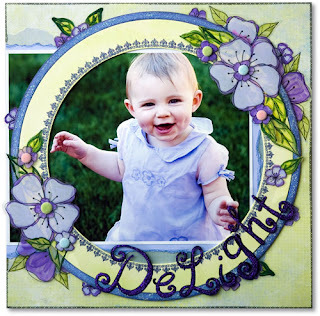 Check out the card gallery on our website for additional projects made with this new stamp set. As with all our stamp sets, a Pocket Full of Posies is made in the USA using environmentally friendly processes. For only $9.99, you can be confident that you are getting the best quality stamps in the world. If you'd like to see more of our Spring 2008 new products, ask for them at your favorite store. Or go to the "New for Spring 2008" page on our website. To Autism Speaks through the month of April 2008.
who has autism. Through her, I learned that autism affects 1 in every 150 children. It is more common than pediatric cancer, diabetes, and AIDS combined. There is no known cause or cure for autism. Based on these statistics and the impact that Eileen and her son have had on me, I decided to try to help change the future of children and families who are affected by autism by focusing our first Tuesday’s Child program on autism. In April of 2007, we released two products—a stamp set called Pieces of the Puzzle, and a set of 12x12-inch Technique Tiles called FUNdamental Pieces—in support of autism awareness. Although we designed these products to include some images and words associated with autism, these products were also intended to appeal to those who may not even know what autism is. We asked our customers to join us in this fight by sharing their stories about how autism had impacted their lives, by supporting a friend who has a child with autism, by raising awareness in their communities, by donating directly to a charity of their choice, or by purchasing these two Technique Tuesday products. We have been thrilled with the response. 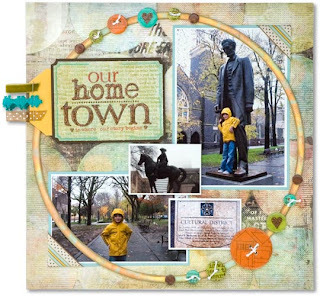 Numerous scrapbookers sent layouts to us that we highlighted during 2007 in a gallery on our website. People from all over the world called us, wrote email, and tracked us down at scrapbook conventions to tell us about how autism has touched their lives. A number of our wholesale customers had fund raisers in their stores or events to promote autism awareness. The response has been astounding. We are also thrilled that we were able to donate thousands of dollars to Autism Speaks so far and we’re not done yet. 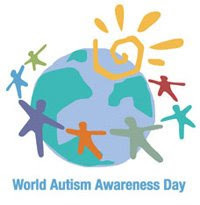 We will continue our commitment to this cause through April (Autism Awareness Month) 2008. These new stamps were released a few weeks ago and should be arriving in your favorite store now! We are SO-Eggsited about this little treasure. Perfect for capturing the joy of the Easter holiday at only $2.49 MSRP, this stamp set is sure to be a hip hoppity hit! 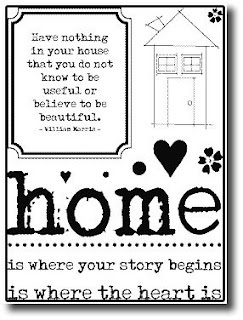 Most scrapbooker's and paper crafter's stories begin at home. Our new Home is Where Your Heart Is stamp set will help you celebrate your family, your stories, and your home. Fresh off our victory for the best journaling tool in Creating Keepsakes Magazine’s Ultimate Product Guide, we’ve added another journaling stamp to our collection. Today is a great little journaling spot is the perfect addition for just a dab of details. I just love to open my email - it is so much more fun than the bills and junk mail that I get in my snail mail! We received this STUNNING layout from Tamera in Valencia, CA. "I used some stuff we had at my LSS for demos and made a page based on some of the pages I had seen in your gallery. It is a display LO for use near our TT stamp area." Tamera used Technique Tuesday Petal Tiles, and Loves me Loves me Not Large image stamps. Thanks so much for sharing Tamera! And type your email address into the little box on the left side of the page - and follow the directions from there! 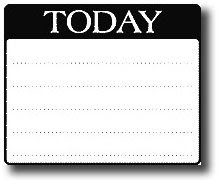 Make sure Technique Tuesday is on your "safe senders" list if you have a strict Spam Filter to make sure not to miss a single issue!